A set of Flower, Gem & Crystal Essence combinations to help you to re-balance your Chakras. The ten Essences in this range are designed to help you to open and balance a specific chakra and to help you to release and work with the thoughts, emotions & energies related to that chakra. Chakras are subtle energy points, literally wheels or vortexes of energy, which act as energy exchange points. 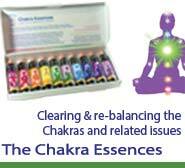 The Chakra Essences help you to work at a deep level with the issues and patterns of each of the chakras that most affect your mental and emotional well being.